A Mexican travel guide. A Kim Kardashian coloring book. Bernie Sanders memorabilia. However varied these items are, they co-existed terrifically as zines displayed on neighboring tables at Pittsburgh’s fifth annual Zine Fair last Sunday, waiting for artists to purchase or trade them. A zine, short for fanzine, is a self-published piece of work similar to a magazine. Zines can be about anything — literature, comics, photography, fanfiction — it doesn’t matter. The fair is put on every year by artists and volunteers dedicated to the craft of zine printing. At the fair in the Union Project, a Highland Park church-turned-artistic venue on Negley Avenue, zine publishers paid either $10 or $20 — depending on table size — to set up a table and showcase, share or sell their work. This year, there were 42 vendors sharing a few dozen tables, as approximately 530 people cruised the aisles in the large assembly hall. Vendors displayed their zines, and any other original creations for sale, in whatever fashion they liked. Add in a few hundred people at a time and a Pgh Taco stand outside, and the result was equal parts colorful and crazy. All the money the Zine Fair makes — from sponsorships and tabling fees — goes toward creating next year’s fair. Its volunteers are Pittsburgh artists, writers and print makers, who created and promoted the fair. Event coordinators — who are self-appointed volunteers — began meeting in June, and continued weekly meetings up until the fair where they secured the venue, reached out to promoters and sponsors, wrote press releases and designed posters, all in preparation of the event. The zine creation process is different for everyone, but hard work remains constant. For Solomon, it begins with the pencil work—writing and drawing the comics. Then, she scans the images into the computer and uses Photoshop to create the page layout and size. Finally, she takes them to the printer, which is the only part of the process where she has any help. Solomon has attended Pittsburgh’s Zine fair every year since it began in 2011. She sells her zines for $5 a piece. While zines can be a fun side-business for creators, some see trading with other zine makers as even more beneficial. “Trading becomes a conversation that lends itself to developing the community, which is what we’re all about. You’ve invested your heart in the work, and you want to distribute it,” said event organizer Juan Fernandez. 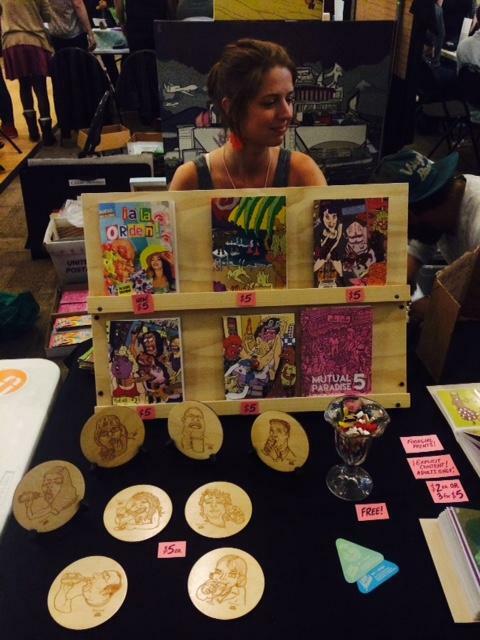 Fernandez creates comic zines and runs the Pittsburgh Comic Salon — an organization that brings together local comic writerss and cartoonists. In creating the Zine Fair, Fernandez and co-coordinator Raiona Gaydos aim to make a space that promotes direct communication between zine creators and readers. Gaydos and Fernandez recognize the significance of zines acting as outlets for writers and readers who have trouble communicating verbally. For those people, Fernandez said, zines are the best form of self-expression. As the Zine Fair’s influence spreads, the artist-reader conversations that Fernandez and Gaydos hope for will become inevitable. From fandom and pop culture junkies to science lovers and political enthusiasts, as the fair proves, there’s a zine for every interest.